Take advantage of ordinary situations to help your 10-year-old practice math in real-world settings. Read on for fun, household activities that provide practice while reinforcing the relevance of math. What Are Fun Ways to Practice Math with Your 10-Year-Old? If you'd like your 10-year-old to practice math at home, think of some ways to make it enjoyable. One of the most effective ways for kids to practice math is with hands-on activities that are well suited for home, like cooking or working with money. To increase your child's interest, participate in the activities yourself. In addition, incorporate math concepts into everyday, real-life events to demonstrate the importance of math while still having fun. 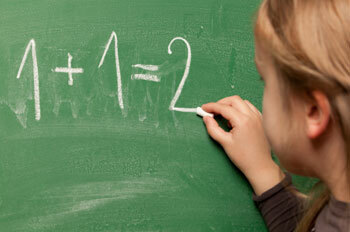 Math topics that 10-year-old kids learn include fractions, decimals and long division. Cooking is an enjoyable way to practice fractions at home. For simple fraction practice, you and your son can simply follow a recipe. For more advanced practice, ask him to double the recipe. For example, if the recipe calls for 1/3 of a cup of flour, he can double the recipe using the following equation: 1/3 + 1/3 = 2/3. Fifth graders learn to divide unit fractions by whole numbers. To practice dividing fractions, only make half of a recipe. Remember to have your son figure out the proper amounts of ingredients. 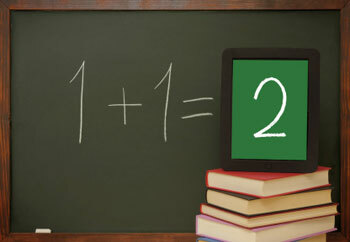 For instance, if a recipe requires 1/2 of a cup of sugar, he can solve the equation: 1/2 ÷ 2 = 1/4. Outside of the classroom, your daughter can practice multiplying decimals with money. Your daughter has already had experience working with money from previous grades, so challenge her by asking her to compute the gratuity at a restaurant. For instance, if your meal costs $46.98, show her how a 20% tip would be about $9.40. This type of problem incorporates many math concepts, such as multiplication, rounding and addition. To figure out the tip, multiply 46.98 by 0.20. The answer is 9.396, which is rounded to 9.40. Then, to find the total amount, add 9.40 to 46.98, which equals $56.38. Encourage your child to solve the equations by hand, rather than using a calculator. Whether it's your child's birthday or another holiday, party planning is inherently fun and requires division. A sample real-world problem may look like this: 18 kids are coming to your birthday and there are 100 party favors. How many party favors can each kid get? Ask your child to help you figure this problem out using long division. To begin, figure out how many times 18 goes into 100 through trial and error. Your child will figure out that 18 x 5 = 90. So, each kid can receive 5 party favors and you'll have 10 left over.